Layer organization. Channel management. These two (or four) words represent quite a bit to compositors these days, as comps get bigger and bigger, and supervisors and directors want more and more. There must be a way to organize your scripts and trees into organized bits of information that can be readily adjusted days, weeks, or months down the line. 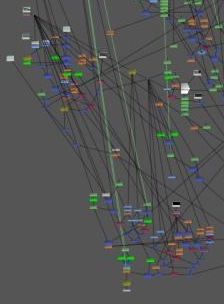 Today I'll explain my methodology of organization, which you may have seen on sites like VFXTalk. If you've delved a bit into my gallery, you'll notice that most of the scripts I present are organized, or at least start off that way, and then they blossom into some kind of freak, mangled tree. Once in a while the tree gets trimmed, and it gets back into some semblance of order. Follow the link below to read how I organize my mind, and how I can get through some of the more difficult comps I've been tasked with. Some of the terminology that I'll be going over is pretty specific, so I've labelled the image below with the jargon I'll be using. In each comp, you're given a set of instructions. Given a live action plate, add the requisite effects to make it look like everything was filmed at once. This sentence is usually harder in practice. Most compositors build their scripts from the top down, where you have your plate and add things to it, one thing at a time. This is usually pretty effective since you have control over every single element that you pipe into the main trunk. Other times, building branches of effects and then piping that into your main trunk will be easier, more controllable, and often faster. The roots of your comp are usually the final outputs, but often you will have roots further up the tree as precomps, which will enable quicker interactivity during compositing. My method is a combination of the two, as well as copious node labelling and note taking. This makes it easier for another artist to quickly take over a comp that I've worked on, or take select bits of my comp to use in theirs. Some artists which I've known in the past are very protective of their techniques, which sometimes work, and sometimes don't. I have often taken a small script and weeded through the extraneous bits, and kept the important nodes for my own comp. For integration of CGI and live action element compositing I approach it in several ways. What is the goal of the shot? What pieces will I have to replace or matte out? What areas will I have to roto or key? Years of production experience will help you in this manner, and that is the reason that comp leads are comp leads, they have the years of experience to direct you in the most quick and efficient manner. In organizing my comp, I will usually lump all CG elements into one branch. each live action element (smoke, debris, fire, etc) is in its own separate branch. This allows me to adjust the CGI as one unit, which can be prerendered if necessary to speed compositing. Sometimes the numerous amount of CG elements will require individual masks from the live action plate, and that will occur in that branch before being joined with the main trunk. Take a look at this script. Can you figure out where the trunk is? What about the CG elements? 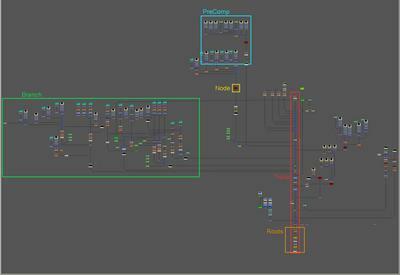 Keep in mind that in this comp in Shake I use over nodes, where A (left input) is over B (right input). Even though it's been two plus years since I've seen this shot, I know exactly where my original plate is, and what I've done to it. Here's where the vital information is. One of the key things you should be able to do is organize in a coherent manner. This means lining up nodes, labelling nodes intuitively, a regular over will become CGoverPLATE or NEOoverSKY, and so on. Groups are beneficial as well. You should be able to group methods of working, like enclosing a sequence of nodes and labelling that Grain Work, or pulling several keys and putting them together and calling that FG key. Some compositing programs have the ability to automatically append the version numbers of your CGI inputs in your script. If it doesn't, it is often beneficial to do so. so you can see at a glance what versions you have if anyone asks. When organizing, do it continuously. Often it can be a pain when your comp starts getting larger and larger, and you just run out of space between nodes to place new nodes. Continually improving the layout of your comp as you work is an advantage that will surely help. I've found that as I near the end of a comp as the deadline approaches, it often becomes easier to just place a node between two others, and slowly build out a bulge on the branch of the tree. This can get messy very quickly if there are numerous revisions near the deadline of a shot! Another method of organization has surfaced, in addition to simple RGBA color management. Combustion has had this for a while, with their RPF file format, allowing different bits of information to reside in other channels of the image, and now Nuke has a similar capability. It allows you to have up to 64 channels of image information. each of these channels are floating point. This allows artists to use any channel as an matte, not just the simple alpha channel included in RGBA layering. For example, my comp usually contains the RGBA layering, labelled as rgba.r, rgba,g, rgba,b, and rgba.a. For other layers there is usually a depth.z, a uv.u and a uv.v, and things like spec.r, spec.g, spec.b. Keep in mind that when you view each of these color channels, they are grayscale (of course) and can contain selected items in the scene. In addition to these regular channels, I can add my own, which I usually do if I'm dealing with a large script which involves multiple channels of information. When I create my masks I usually name them maskA, maskB, maskC, and so forth. Each of these masks can contain four channels, which I label maskA.r, maskA.g, maskA.b, and maskA.a. However I don't have to follow the r,g,b,a naming convention, and I could just as easily label them maskA.front, maskA.middle, and maskA.back. There is no wrong way to comp, only easier and faster. Only production experience will get you to the easier and faster method, simply because you're running on someone else's schedule, not your own. LIke almost every industry, the acronym, KISS, is most important to remember. Hopefully the above tips will help you in production, and make you a quicker and more efficient compositor! This page contains a single entry by Aruna published on September 8, 2006 6:40 PM. Flags of our Fathers US Trailer was the previous entry in this blog. Another Shot in Cinefex is the next entry in this blog.